Webster University graphic design students got an inside perspective of opportunities and careers in the field of design through the Graphic Design Employer Tour sponsored by the Career Planning & Development Center and faculty of the Department of Art, Design and Art History, on Friday, Nov. 20. Students took their classroom education on the road and embarked on an all day, four organization tour through St. Louis, visiting Momentum International, St. Louis Art Museum, HughesLeahyKarlovic (HLK) and Purina/CheckMark. This was an opportunity for students to expand their knowledge of graphic design in a variety of work environments including agency, non-profit and corporate. Many of the tour speakers were Webster University alumni and adjunct faculty. The students also got a taste of creative work spaces -- from a roller coaster chair in one of the conference rooms of Momentum International, to the wooden plank floors of the historic train station that now houses HLK, and the pet-friendly halls of Purina where employees can bring their dogs. 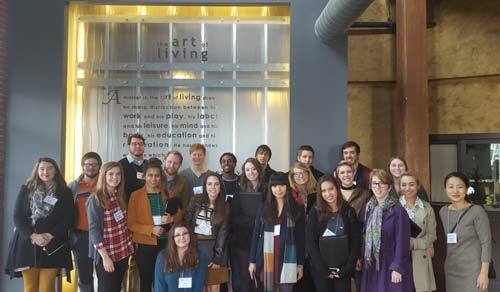 Graphic Design students from Webster University had the opportunity to visit HLK as a part of the Graphic Design Employer Tour held on Friday, Nov. 20. ”There's a lot each of us can take away from this experience as we continue to explore companies and grow our networking skills, and for many it was a great first step," said graphic design student Ashley Webelhuth.